A common question most people have everyday is, “What will I eat for lunch?” It’s an important question to our lives, for sure. A good lunch can set your mood for the rest of the day, a satisfying meal leaving you full and happy. Given how important lunch is then, it’s imperative to know a good place to eat. Greenville has its pizza parlors and fast food chains, the student union and coffee shops, but there’s one place you might not have heard of. 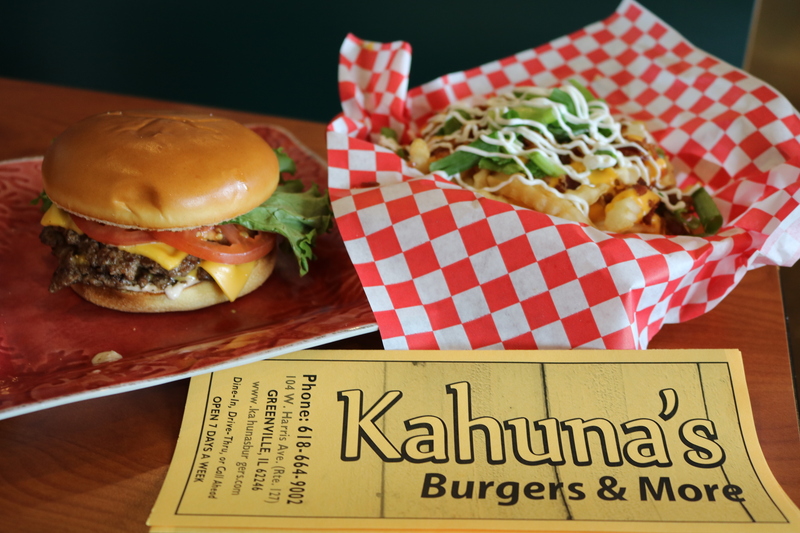 Kahuna’s Burgers and More is a local burger joint that is quite simply the best in town. It isn’t just the amazing food that makes this fact, but everything that makes the restaurant whole. The atmosphere is always welcoming and comfortable. Classic songs anyone can enjoy will be playing, accompanied by the sports and news channels you’d expect to see. There are even electronic card games in the back for those inclined. Not to mention, the overall style and aesthetic is fitting for such a place. 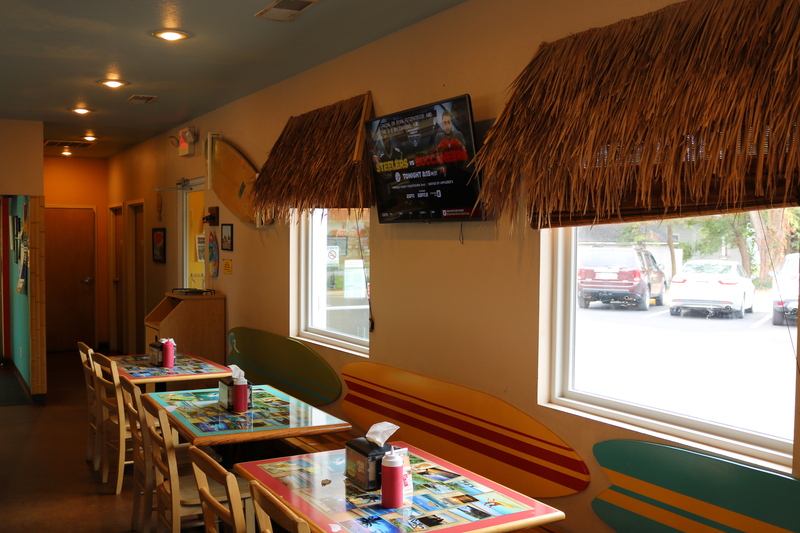 Sitting down you’ll see thatch window shades and old beach shack props, like the surfboard that hangs above the booths. Weather willing, there’s even an outdoor seating area with umbrellas and a grinning tiki head to keep you company. The staff is also very welcoming and warm, contributing to the atmosphere there. Now I know what you’re thinking, “Enough about that, what about the food?,” and I’m happy to get to it. 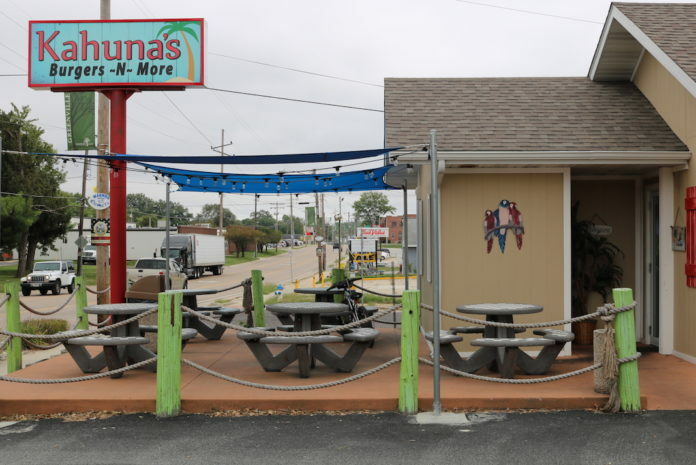 However, first and foremost it should be highlighted that Kahuna’s offers a special deal for students of Greenville University. So, as long as you have your student ID on you, you’ll be able to enjoy a 10% discount on any purchase. The signature Kahuna burger and an order of loaded fries only cost me $8.50; a more than an acceptable price for a delicious meal. The thing about the food here is that it’s always made fresh, straight from the kitchen to your table. Talking with the manager I found out the patties are freshly ground each morning, ingredients are locally bought, and they make several signature sauces from scratch. She even made a point that the fried mushrooms are a fan favorite- carefully breaded and cooked to perfection. Of course, I always knew the ingredients were fresh. A single bite will be enough for you to know, as well. The lettuce is always crisp, the tomato freshly cut, and the patty large and well made. This standard held up throughout my meal as well. The burger didn’t last long and a large plate of fries complemented it. That’s another thing about Kahuna’s, the portions are huge compared to other places. Their burgers being large enough that you’ll need both hands for them. The menu is also much more than your standard burger and fries. Large leafy salads, fat wraps, and various sandwiches make up large sections of the menu. In fact, as I was leaving I saw them carrying a salad out and I felt disappointed I didn’t order one. It would have made for a great photo, large, colorful, and delicious looking. One item I’m partial to is their chicken wrap, made in a pita with a special sauce. Nowhere in Greenville, that I know of, can you find a gyro and the wrap makes up for that perfectly. Finally, as most meals should end, we have dessert. Kahuna’s offer a great selection of ice creams and related items. At the behest of one of our known editors, I tried one hearing it was even better than Dairy Queen. 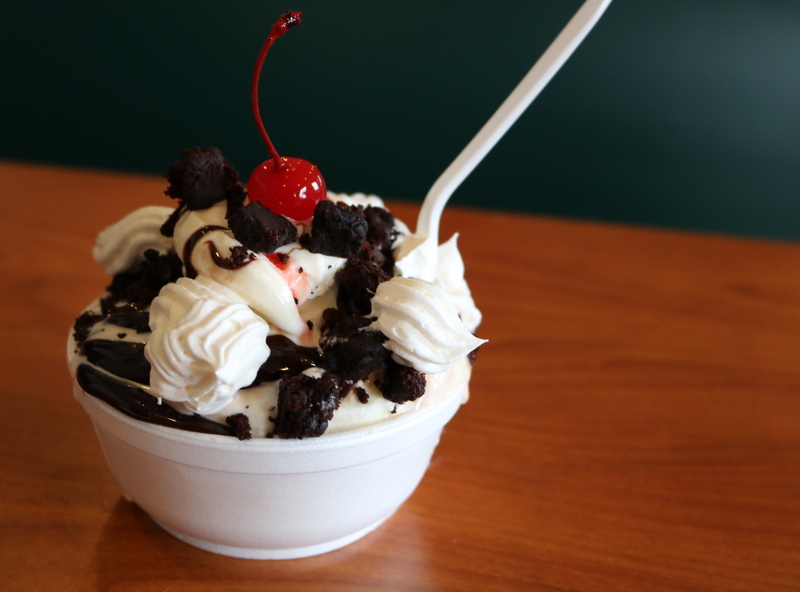 I ended up getting a Mud Slide Sundae, a bowl of ice cream topped with hot fudge, brownie chunks, whipped cream, and topped with a candied cherry. To my surprise, my editor’s comments were true. The ice cream was definitely creamy, just the right consistency you’d want for soft serve. Truly a good finish to yet another amazing meal from Kahuna’s. It’s almost like no matter what you order, it will be good. I’ve known about the place for little over a year, slowly making my way through the menu when I have money to spare. It’s simply too good of a place for people attending GU to not know about, so I hope you found this informative. Maybe I’ll see you around sometime, but no, it will not be on me. Next articleGU Volleyball continues to RISE!